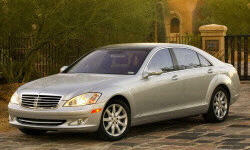 Mercedes-Benz S-Class Pros and Cons | Page 1 of 1 | Why Not This Car? What drives people to buy (or not buy) a certain car? TrueDelta's members share Mercedes-Benz S-Class pros and cons based on their real-world driving experiences. Its like your mothers womb, once your in it you never want to leave. While on long trips at 70-80mph I average 32mpg around town it never goes better than 24mpg. Easy on the pedal sure shows results but fully loaded the thing shifts like a two door sports. Expensive New, but a great deal used. I love this car, though I admit it may not be for everyone. Its fast, beautiful, reliable and gets great gas mileage. Some german quirks, but I've found that quirks were implement to improve reliability, so maybe cut the engineers a bit of slack there. An amazingly engineered vehicle. Can't say a bad word about that car. Everything on it is made with a lot of tought. Love the looks of the Amg sport package on this car. See TrueDelta's information for all Sedans, Coupes, and Convertibles.